Do you love to entertain your family and friends? Create one of a kind birthday parties? Or maybe you have a special occasion coming up and want something really exciting to wow your guests! Well let me tell you, you need to go and pick up a copy of Stampington’s latest publication, Mingle. I knew that this would be another great magazine from Stampington, aren’t they all? But when I opened this it took my breath away. The photography is superb and it’s full of amazing events and small gatherings with a layout that invites you into each one. It’s inspiring to look at and gives you close up shots and so you can see all the little things that make an event special. With the holidays coming up you will definitely want to browse the pages for ideas for setting beautiful tables, to appetizers and dressing up simple drinks. I’m going to keep my issue out on my coffee table (one of the things I love about Stampington’s publications is how heavy and nice the pages are, almost a book feel) and I’m going to give away the extra copy to one of you!!! All you have to do is leave a comment on this post to be entered. How about telling everyone what your favorite Stampington publication is? I will use that faithful old random number generator and see who the lucky winner is this Wednesday, October 5th. I have never seen any of the Stampington Magazines. This new one looks great I have a very special Golden Wedding anniversary to organise next year this magazine would probably be great for vintage ideas! i am home with a broken foot and sure would love to be the lucky duckie who wins! stampington forevs! All right, I’m off to the random number generator to draw the lucky winner! I love the Stampington publications, I would love to win a copy of this new one. Thanks for offering such a fun prize. You make it sound so wonderful, Pam! I’d love a copy of Mingle and I live so far away from any opportunity to get one! I am partial to the tried and true Somerset Studio, but read the others avidly as well. This new publication will certainly find a home with me. I just picked up a copy of Sommerset Home recently. I don’t have a favorite, they are all beautiful and you have created an addiction in me. Green Craft, Sew all beautifully done and great to look at over and over again. Would love to see this one on my coffee table too! Thanks for the give away! Sounds like a great new publication! Hope I am in time. I am not sure of an all time fav. I like Somerset Studio for many of the same reasons you like “Mingle” Great photos and heavy quality pages. I Also LOVE the Somerset Gallery..I get more photos of the projects which really inspire me! I love the cover of Mingle! Your description of the inside sounds exciting too! I think my favorite Stampington magazine is GreenCraft because I love the style and the articles encourage me to recycle, upcycle and reuse everything. Thanks for the opportunity to win a copy of Mingle! I love the idea of a magazine devoted to gathering. ” Where Women Create” has to be my favorite but, this new publication could change that. Pam, My favourites are Sew Somerset and Quilting Art Studio. So inspiring!!!! I would say art journaling or where women create – both inspiring! My favorite Stampington magazine is Somerset Studio. Wow, a great new magazine from them. They are definitely a class act company. But we can only pick one favorite?! I guess I would have to pick the one that never fails to stimulate me – Somerset Studio. Or is it Artful Journaling….. I really couldn’t live with just one. It looks awesome! Would love to win it! Love this idea of “creative gatherings” magazine. As 1/2 of a husband/wife on-site management of a small hotel in the Pocono Mts. in NE Pa.I think I’ll love this magazine! Hi Pam, my favorite Stampington publications are (I have 2 favorites) “Art Doll Quarterly” and “Workshop”. Thank you for your giveaway. 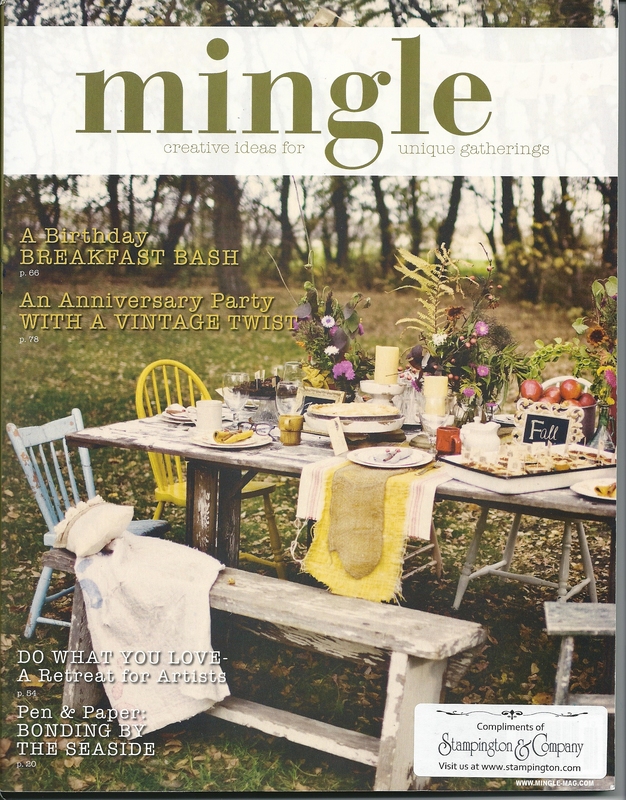 Mingle sounds like a great magazine and I’d love to win a copy! My favorite Stampington magazine is Art Journaling. My favorites are Somerset Studio for the mixed media projects and Belle Armoire Jewelry for the jewelry, of course. I would love to see a copy of this new issue so thanks for the opportunity. I would love to own this issue. Only recently familiar with the publication since following your posts. If I do not win it, I will buy it. Oooweee. My first thought (before I read the entire post) was, I’ve got to get it today! It is sure to be a hit. I don’t entertain as often as I’d like, but will get oodles of ideas from every page. Thanks for sharing, Pam. I love all their magazines, but so far I’m really liking the Sommerset Memories. It has a little of everything in it…art journaling, family heritage projects, scrapping and more. I wish my local store carried the Art Journaling magazine because I think I’d like that one too. Along with almost everyone picking a favourite is difficult, they are such beautiful publications, but I think mine would be Somerset Studio. Thanks for the chance of winning a new one! I love them all but my two favorites are Digital Studio and Art Journaling. I love how Digital Studio shows how graphic design and mixed media worlds have melded together. Art Journaling opened up a whole new world of inspiration for me. Yum! Yum! Yum! thanks for sharing, Pam! This mag looks amazing! It’s hard to pick just one since I love them all. I guess Somerset Studio would be my #1. That’s a hard question, because I love a lot of their magazines, but at the moment, I’m going to have to give the crown to Art Journaling. My heart does a happy skip every time I see a new cover, and I know what I’m doing the rest of that day. My faves are Somerset Studio and Somerset Life. I, too, love all of Stampington’s magazines. As an event planner I have been looking forward to this new publication…but my favorite is Belle Amoire Jewelry followed by a close second Somerset Studio. my favorite is “Art Journaling” and i recently heard it will be coming out quarterly!!!!!! Yahoo!!!!!! Thank you so much for this……can hardly wait to see it. And thanks for the contest! I’ve only seen two of them, ‘Somerset Studio’ and ‘Art Journalling’ and love them both. I have just subscribed to ‘Somerset Studio’! As someone mentioned above they are not readily available here in Australia! Hint, hint to the Somerset people! Art Journaling is my top favorite but I also adore the specialty issues – Love, Marie, etc. So many projects, so much to do, so many hoarded papers and bits and pieces……..
Oh, that looks lovely! My favourite has always been Somerset Studios. I’m a magazine junkie and would subscribe to almost every one if I could. Such an outstanding collection of magazines! My favorite is Art Journaling! I have to say Somerset Life is my favorite Stampington publication. After seeing the cover of Mingle on-line, it may take the lead! Thanks for sharing your incredible work with us. i dont have a favorite cause they are all sooo good! if i could afford to buy them all i would…and i have to admit i have skipped meals to have months of bliss owning copies of Stampington magazines i could not resist. I to love all of the Stampington publications and I am sure I will love Mingle because I enjoy entertaining. Hope you love Texas. sounds like a great magazine. I love looking at them all at the bookstore. The only one I have purchased so far is several issues of Art Journaling. I love it. My favorite is Somerset Life followed closely by Where Women Create and Apprentice and. . . LOVE them all!! Thanks for the chance to win! Can’t wait to see this issue! Love them all. Thanks Pam for an opportunity to win. My favorite mags are Somerset Studios and Take Ten. Hi Pam, Thank you for this opportunity to win! All the Stampington publications are really wonderful, and I have chosen Where Women Create, since I love to see artist’s studios. I have a stack of these and have gone over them what seems like a million times. Thanks for being so good to all of us! Somerset Studio is a great publication. Love to have a chance to win. Ooh, that cover is lovely! I’d have to say that my favorite publication is Take Ten. I read it over and over. Thanks Pam! THank you for the opportunity Pam. My favorite Stampington mag is atie for CPS and Art Journaling. Oh yes, I love Somerset Home…. Stampington has fabulous mags. I love art journalliung, and would love to win this book, great idea to keep it on your coffee table. Somerset Studio is definitely my favorite–I love many others, but these I return to time & time again. That’s a difficult question, LOL! I love all the beautiful cards in Take Ten, the varied artists in Art Journaling, and the instruction in Somerset Workshop. Somerset Studio will always have a special place in my heart, however, because it was the magazine that inspired me to start rubber stamping. Althought the magazine has changed over the years, I now enjoy the mixed media artists that are featured in its pages. Another gorgeous magazine that I hope comes down to Australia. I have my favourites of course- studios and art journalling. Stampington do publish some amazing magazines and books that are a must-have to any artist. Thank you for such wonderful blog. Hope you are all settled into your new studio now. I love Somerset Studio, also Art Journaling, basically I love them all!! I really like Somerset Studios, but I love Sew Somerset. Great magazine. I really like Art Journaling the best but Life would be my next choice! Would love to win this magazine, I cann’t wait to be inspired! The magazine cover looks so enticing. It will bring hours of fun to a lucky winner. If I win I promise to pass it forward when I am finished with it. It looks too nice to just sit on shelf to collect dust. I love Art Journaling, but am curious to see this what this magazine is all about! I have subscribed to Somerset Studio for a number of years. I have enjoyed reading Art Journaling as well when it is available. Thanks for the chance to win a copy of Mingle. Most difficult to choose a favorite…but since I am setting up my studio-Where Women Create. Love the inspiration it provides. Thanks Pam for a chance to win this new magazine! My favorite publication is the Art Journaling one … it never fails to impress and inspire. Somerset Studio is a close second — that was my first Stampington publication and one that I adore just for the sheer breadth of style it’s been delivering lately. Interesting. I would love to win one to try them. I really admire your work! Oh, I would love this! I will pick Art Journaling … but really, all are exquisite! my fave for all time is Inspirations. This book looks amazing however, and I would love to win a copy to check it out! Oh, please count me in as someone loving to have this new publication! Who knows, maybe this will become my favorite! Oh gosh how to pick my favorite, I love them all. I always buy Artful Blogging, Somerset Life, and Somerset Studio. I own most of the GreenCraft Issues and Somerset Life too. ANd even though I don’t make much jewelry I do have several issues of the Belle Amoir Jewellry too. Well you get the idea, I have a bookshelf full of the publications and have no plans to restrict my addiction. I do love the thick pages and great quality of the whole publications and I read through them over and over – and now there is a new one! would love to win this – favorite? whichever one i have in my hands! Lovely new magazine, how to chose a favorite oldie? Belle Armoire Jewelry stole my heart the most when I first saw it. Also, Altered Couture. Up till my first meeting with these, I didn’t know this type of beauty existed! i love them all but right now if i have to pick i’d pick the art journaling magazine. This magazine looks awesome – I am constantly amazed by the quality that they come up with. yikes, how can you limit it to one favorite. It’s like picking an ice cream flavor…..so many flavors so many calories, so little time. Yes – Stampington publications are fabulous. My favorite is Somerset Studio, followed closely by Art Journaling. I am definitely addicted. All of their magazines are so beautiful! I always put money aside to get the new ones at the beginning of the month!!! I especially like Somerset Home, Art Dolls, Apprentice, Workshop…… oh my gosh! I can’t pick just one!!!!! Can’t wait to see this publication! I have been anxiously waiting for this publication also!!! I host a retreat in my home in Key Largo every year (Keys 4 Art) with 15 amazing women. Last year we had Julie Nutting and Ingrid Dijkers teach workshops and this year we are delighted to have Lynn Perella!! Anyway, I was thinking about submitting our little retreat to them!! !